Iconic’s latest window display across its stores celebrates sunshine season with interesting use of props and all the warm summery colours. 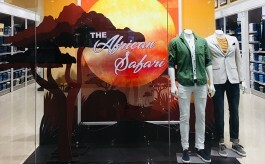 Iconic recently executed its interesting summer theme across its stores in India. The windows are designed with an artistic approach. “It is inspired through art which is what makes it so Iconic”, said Devshri Dayal, VM, Iconic. The Summer theme was executed with the use of canes, ants and spotted banana leaves as props. The colours bring in the earthy vibes of summer season. The same theme has been used for the kid’s section as well. Since the window displays are inspired through art and the merchandise changes after 15 days, they adapt the merchandise to its windows. This theme can be seen at all the 18 stores across the country. 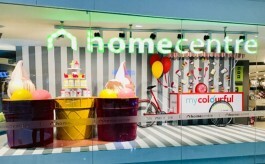 Delhi-based VM agency, Few Steps Ahead is the agency behind the design concept for the windows. HG Graphics has crafted the ants in the windows display as well as worked on the entire installation of the art. Kartikeyan Enterprises worked on the stones and the palms for the display.